Tuesday afternoon's practice session was cut short after a thunderstorm rolled past Redskins Park bringing in some big lightning strikes. 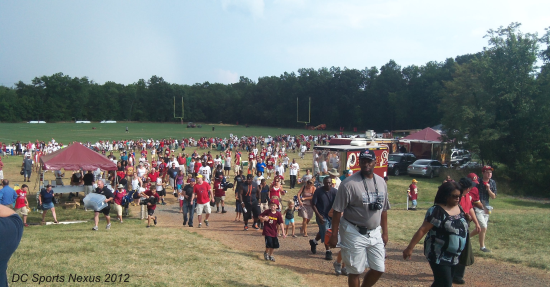 As the players marched off the field and into the practice bubble, fans realized that their chances of obtaining an autograph were going to disappear. Before the rain came in, the fans were treated to some one on one WR/CB drills as well as a quick 11 on 11 session. While Rex Grossman threw passes into triple coverage, RG3 was making much better decisions. Cooley's training camp woes continued. Grossman hit Cooley with a nice pass but the tight end fumbled the ball, which makes at least 3 fumbles in training camp so far including one at the one yardline in Monday's scrimmage. Brandon Banks missed a wide open ball towards the sideline and after it fell off his hands like they were bricks he kicked the ball into the crowd in disgust. A few plays later he made up for the mistake as he burned a corner for a long touchdown. Both Terrance Austin & Anthony Armstrong performed well. Austin has been the biggest deep threat at camp so far.